Rhodes Ranch is a guard gated, golf course community located in the Southwest Las Vegas Valley. Rhodes Ranch real estate is at the base of the Spring Mountains and located 12 miles from the Las Vegas Strip wit a golf course designed by architect Ted Robinson. The community is developed by Rhodes Homes & Dunhill Homes and is planned to have 7,000 homes upon completion. This community offers reasonably prices homes with great amenities. 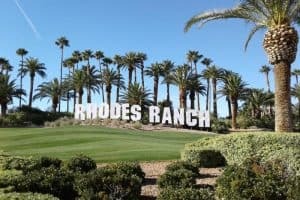 Rhodes Ranch real estate offers easy access to all major travel routes via the 215 beltway and the word famous Las Vegas strip in only 15 minutes away. Zip code for Rhodes Ranch homes for sale is 89148.